While out with friends one evening, you take a bite of ice cream. Suddenly, pain shoots through your teeth. It only lasts a second, but it's enough to ruin your good time. 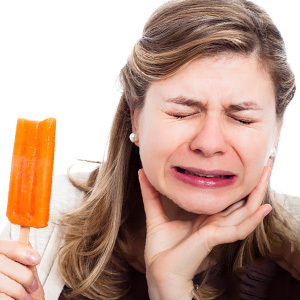 This could be tooth sensitivity, a painful reaction to hot or cold foods. It often occurs when the enamel in prolonged contact with acid has eroded. Acid is a waste product of bacteria found in plaque, a thin film of food particles that builds up on tooth surfaces due to inadequate brushing and flossing. Enamel normally mutes temperature or pressure sensation to the underlying dentin layer and nerves. Loss of enamel exposes the dentin and nerves to the full brunt of these sensations. Sensitivity can also happen if your gums have shrunk back (receded) and exposed dentin below the enamel. Although over-aggressive brushing can often cause it, gum recession also happens because of periodontal (gum) disease, a bacterial infection also arising from plaque. The best way to avoid tooth sensitivity is to prevent enamel erosion or gum recession in the first place. Removing accumulated plaque through daily brushing and flossing is perhaps the most essential part of prevention, along with a nutritious diet low in sugar and regular dental cleanings and checkups. It's also important to treat any dental disease that does occur despite your best hygiene efforts. Gum disease requires aggressive plaque removal, especially around the roots. While receded gum tissues often rebound after treatment, you may need gum grafting surgery to restore lost tissues if the gums have receded more deeply. For enamel erosion and any resulting decay you may need a filling, root canal treatment or a crown, depending on the depth and volume of structural damage. While you're being treated you can also gain some relief from ongoing sensitivity by using a toothpaste with potassium nitrate or similar products designed to desensitize the dentin. Fluoride, a known enamel strengthener, has also been shown to reduce sensitivity. We can apply topical fluoride directly to tooth surfaces in the form of gels or varnishes. Don't suffer through bouts of tooth sensitivity any more than you must. Visit us for a full exam and begin treatment to relieve you of the pain and stress.